Home Tags Posts tagged with "no more rhyme"
That’s it how it feels to listen to a highly-anticipated second album from an artist after you’ve been won over by a captivating debut. Quickly, “cautiously” was surely removed from the experience. Gibson had an impressive track record to follow. “Blue” yielded four Billboard Hot 100 top 10s in 1987-88: the No. 4-peaking hits “Only in My Dreams” and “Shake Your Love,” the No. 3 title cut and her first No. 1, ballad “Foolish Beat.” The album peaked at No. 7 on the Billboard 200 in a hefty 89-week run and was certified triple-Platinum by the RIAA. The “Electric Youth” title cut (No. 11) and ballad “No More Rhyme” (No. 17) both hit the Hot 100′s top 20, with Gibson listing fourth single “We Could Be Together” among her five favorite songs of hers (when pestered last year by a certain zealous fan to rank her releases in order of preference). On the milestone 25th anniversary of the release of the double-Platinum-certified “Electric Youth,” Gibson muses on many facets of the album, along with plans for upcoming projects, all with an energy that aptly mirrors the set’s lasting effervescence. Gibson: I love this question and it definitely applied, but not to my first two albums, because, in a way, I feel like they were my debut combined. I had presented Atlantic Records with more than a hundred songs before they signed me, just to release “Only in My Dreams” as a 12-inch single, to make sure it wasn’t a fluke, since I was a teenager who wrote. So, even though some of the songs [on "Youth"] were written after “Out of the Blue” came out, many were actually from that first batch of songs I wrote between the ages of 12 and 16. Also, the beauty of recording as a teenager is that you don’t really know pressure yet. I had no bills to pay and I lived with my parents, so it was all really a glorified hobby to me. Pressure just did not enter into the equation. I’m thrilled to say I have now taken real-life moments to accumulate my next batch of songs for an upcoming record. I feel like it’s “Out of the Blue” and “Electric Youth” all over again, because I am in a true channeling mode that can only come from giving yourself the luxury of time and living, as opposed to trying to create, or recreate, something. It’s funny to think a maturation process happens between the ages of 16 and 18, but I think, yes, those songs do represent a more poetic/less teenage point-of-view. And, now thinking about it, I had traveled the world in the time between “Out of the Blue” and “Electric Youth” and went from rags to riches, so to speak, all of which will grow you up real quick. 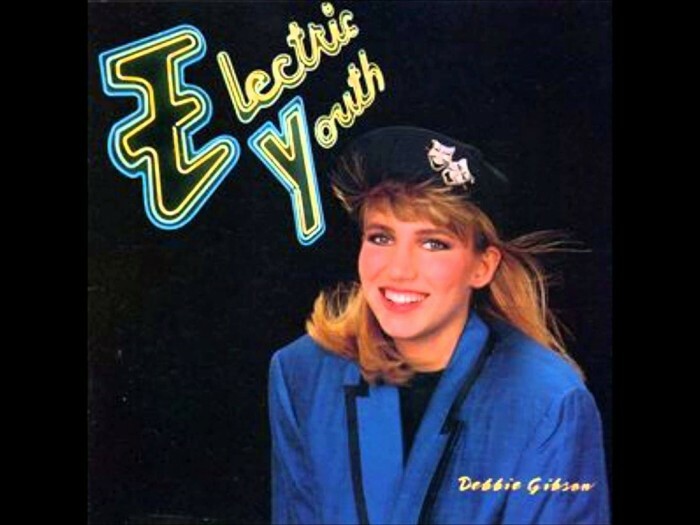 How did “Lost in Your Eyes” come to be the first single from “Electric Youth”? I had started performing that song on the road on the “Out of the Blue” tour. From the opening two bars of the piano intro, it elicited screams from audiences. It had yet to be recorded or played on the radio, but it was already a hit. That’s not ego talking. It’s just true of any artist and any song that has that feeling of being familiar, yet new. My acting teacher, Howard Fine, said that phrase to me in relation to what is a hit, be it a hit piece of theater or a hit song. It’s so true. It’s like an old friend. You predict that the melody is going to go in a satisfying way. Was there any trepidation, either from you or the label, about releasing a ballad first, with pop radio historically tempo-driven? Obviously, the success of “Foolish Beat” provided key evidence that you know your way around a ballad. I don’t remember exact conversations, but it was no contest. And, at that point, I instinctually knew what would work next for me in my career. I had also witnessed firsthand audience response to the song on the “Out of the Blue” tour. Source: www.billboard.com Also, read part 2 of the interview here.